High on our “must see” list of New Zealand birds was the world’s smallest penguin, the Blue (or Fairy) Penguin, Eudyptula minor. We actually caught a brief glimpse of one swimming near the boat during our dolphin cruise at Akaroa, but for a proper view we visited the colony at Oamaru. Located in a disused quarry on the south side of the harbour, the colony has a purpose-built viewing stand where you can sit at dusk and watch the penguins return from their day’s fishing. The penguins return in rafts of 10 or more birds, first appearing far out at sea and paddling slowly towards the shore. 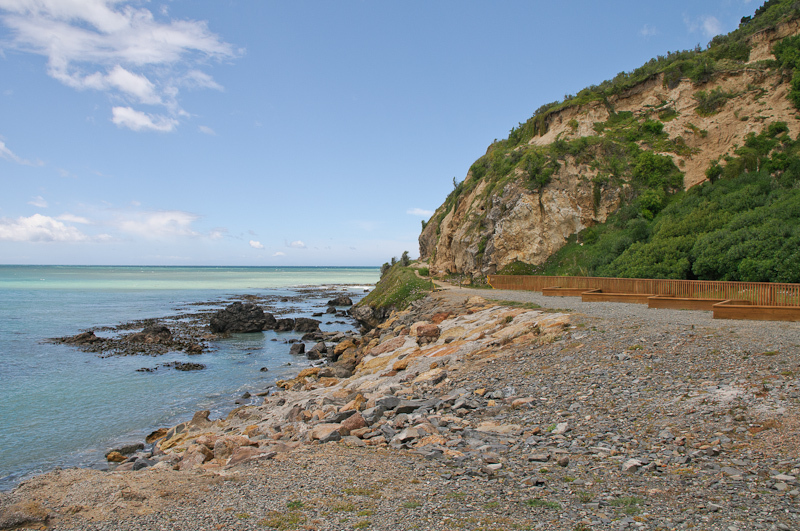 The photo on the left, taken from the viewing stand during daytime, shows the rocky slope where the penguins scramble out the water. They then pass through the fence on the right hand side of the picture (the wooden baffles help guide them to the entrances) and into the colony beyond. Each penguin pair has a nestbox in the colony, but when they first come ashore they tend to stand around in small groups and socialise – very loudly! All photography and recording is banned during the evening viewing sessions to avoid the penguins being disturbed by camera flashes and autofocus lights, but once the session was over and we returned to the camper van we realised that the parking area was right next to the colony boundary, and the penguins were clearly audible. Apparently some penguins cross the parking area and nest in the vegetation on the far side – colony staff warn you to check under your vehicle for penguins before driving off! I stuck my MiniPiP boundary array on the camper van roof and got this recording – there’s a lot of noise from other visitors and vehicles, but it still captures the amazing chorus of sound these little birds produce.